Key Takeaway: As children, we dared to dream, to trust, and to be crazy. As adults, many of us have lost this vision and childlike innocence that has always been instrumental in true living. Let’s take a step back and be like children again, that we can truly change the world and make an impact. For today’s discussion, let’s go back in time. A time when things were simpler and more carefree. A time when responsibilities were less (but not necessarily zero). A time when we dared to imagine and dream the incredible. The time when we were children. The typical image of children in our mind is that of inexhaustible energy, total purity, and wide-eyed fascination with things around them. Unblemished, delightful, and creative. Yes, it does: So is purposeful living. Living your purpose – even though there are times that you want to just run away from it all – is always ultimately interesting, motivating, and joyful. Purposeful living is just like childlike living. As we grow older, learn more about the so-called “ways of the world” or “real world”, and take on more responsibilities for ourselves and others, many of us forget to become like children, to bring out the inner child in us: to dream, to trust, to enjoy. Imagine the scenario of the parent too busy “providing” for their child that they forget to truly provide for them: the time and love that children most want. If we want to live truly good lives, truly purposeful lives, it’s always good to take a step back, to recharge, to submit, to imagine. To recharge is to rest and regain energy to live and love. To submit means to accept and to surrender to God, to trust that he will take care of us. To imagine is to dream, to dream big and to include others in the dream. Just as children rest, trust, and dream themselves. In the Gospel of Matthew, Jesus tells his disciples to “let the little children come to [him], and do not stop them; for it is to such as these that the kingdom of heaven belongs” (Mt. 19:14, NRSV). Why does the Kingdom of Heaven belong to the children? It is because they place absolute trust in the person responsible for caring for them, and do not have any sense of arrogance that they do not need anyone else. This isn’t to say that we shouldn’t be proactive and take the initiative to be independent persons. We should be childlike, but not childish. We should learn to stand on our own feet – but to never forget that we are part of a community, that we exist with others, that it is our duty to love them and ourselves, and to remember that there is a divine providence watching over us, guiding us… we just need to ask, to surrender. As children, we dare to dream and unabashedly say whatever we want to be. As adults, we have somehow lost this confidence and vision, instead choosing to establish ourselves in the “real world”, craving the most for things like stability, prestige, or wealth. In purposeful living, we do crave for certain things – to be of service, to truly live to the fullest, to leave an impact on others without necessarily asking for anything in return. We dream big, but for others, not for ourselves. Children also bring with them an unquenchable sense of delight and optimism that many of us as adults have lost or deliberately suppressed. To go wide-eyed and fascinated about the world we live in is to be connected to it fully, and in being aware, being of service, and being loving, we should learn to immerse ourselves in our own experiences and that of others, that we can be truly inclusive, truly other-oriented, truly loving. Idealistic? Crazy? Well, we’ve got news for you: Those who live by their ideals and are not ashamed to do so, believing that they really have the power to make an impact or change the game, are those who do so. Understandably, not all children carry this idyllic existence. There are children whose lives have been torn apart by unpleasant things such as illness, death, poverty, or war. But it’s never too late to be childlike again, to have the courage to dream, to live. 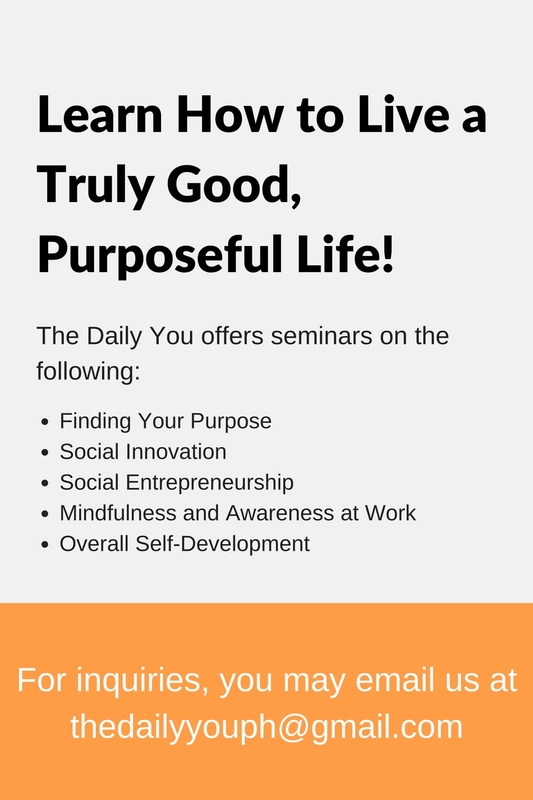 Purposeful living starts with you… the daily you. Tags: childlike, children, higher purpose, Purpose, TDY, The Daily You, Today. Bookmark the permalink.